James Gunn on Short List to Direct Guardians of the Galaxy? 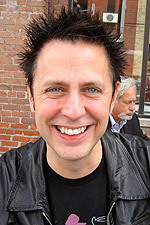 Now, according to The Hollywood Reporter, filmmaker James Gunn is being mentioned as one of Marvel’s top choices to direct the movie, saying that they like his sensibilities and his ability to mix action and horror, something he shares with The Avengers director Joss Whedon (who also wrote and produced the long-delayed Cabin in the Woods, released a month before the summer blockbuster). Gunn previously directed the horror comedy Slither and the violent superhero comedy Super, starring Rainn Wilson and Ellen Page, neither huge box office successes, but before that, he wrote the Dawn of the Dead remake for Zack Snyder and the Warner Bros. live action Scooby-Doo and its sequel. Other names in the running according to the story are Peyton Reed, who directed mainstream comedies Bring It On, The Break-Up and Yes Man and was also the original planned director for 20th Century Fox’s Fantastic Four, and the more unconventional choice of indie filmmakers Ryan Fleck and Anna Boden who came onto the scene as the directors of Half Nelson, starring Ryan Gosling, before directing the baseball drama Sugar and the coming-of-age movie It’s Kind of a Funny Story. Incidentally, Fleck and Boden were just recently announced to direct MIssissippi Grind, potentially starring Jake Gyllenhaal. As is normally the case, Marvel Studios won’t comment on deals and negotiations in progress so we probably won’t know who scored the gig until they announce something official. In the meantime, you can read some of our previous interviews with Gunn here, here and here.